SACRAMENTO, Calif. – The Division of Boating and Waterways (DBW) is now accepting grant applications from public government entities for the purchase/deployment and maintenance of floating restrooms across California’s waterways. Interested entities should review the grant guidelines and submit the grant applications to DBW’s office by 5 p.m. PST Nov. 15, 2018. The Floating Restroom Grant Program helps reduce pollution from recreational boater sewage by providing floating public restrooms in areas with limited landside access. Over one million gallons of sewage are kept out of California’s waterways each year with the use of floating restrooms. Solar-powered, the holding tanks of these facilities capture about 500 gallons of sewage. Earlier engineering designs of floating restrooms were known as S.S. Relief Stations. California State Parks engineering group re-designed the restrooms for this 2019 grant cycle to be ADA compliant. For this year, a total of $840,000 in federal and state funding is available for the purchase and deployment of approximately nine DBW-designed and developed ADA-compliant floating restrooms. Grants are also available to offset ongoing operation and maintenance costs of these units. To be eligible for funding, grant applicants must operate a California lake or reservoir that is open to the public. DBW staff will rank the competitive grant applications according to need, as well as the ability to operate and maintain the floating restrooms for at least 10 years. The division expects to announce grant recipients early in 2019. The Floating Restroom Grant Program is available through the Clean Vessel Act, which is funded by the U.S. Fish and Wildlife, Wildlife and Sport Fish Restoration Program and the Harbors and Watercraft Revolving Fund. More than 260 floating restrooms have been placed on California lakes and reservoirs through this grant program since 1972. About 160 restrooms are currently deployed. General information on the grant requirements and online application can be found on DBW’s Floating Restroom Grant webpage. SACRAMENTO, Calif. – With boaters and water enthusiasts heading to California’s waterways for summer’s last hurrah this Labor Day weekend, the Division of Boating and Waterways (DBW) is reminding everyone to take extra precautions to prevent a tragic outing. Wearing a life jacket is the number one way that someone can increase his or her chances of surviving a boating-related accident. California’s recreational boating statistics repeatedly show the holiday weekends of Memorial Day, Fourth of July and Labor Day to have the most accidents and account for 15 percent of accidents each year. The majority of drowning victims are often found not wearing life jackets. Nationwide, the U.S. Coast Guard reports that three out of four boating fatalities could have been prevented if the victims had been wearing life jackets. Many of today’s life jackets are lightweight, easy to move in, and come in many sizes, styles, and shapes for every person and every sport. No matter what type of life jacket is chosen, it is important that a life jacket fits properly. Life jackets designed for adults will not work for children. Coast Guard-Approved: Only approved life jackets should be used on the water, and boaters may be cited for lacking proper equipment. All life jackets approved for use by the Coast Guard will have an approval number located on the inside label. Intended Boating Activity: Always check the life jacket label to ensure it is approved for the intended boating activity. Under California law, a life jacket is required for each person on board a recreational vessel. Children under 13 years of age on a moving vessel of any length, all personal watercraft riders, and anyone being towed behind a boat are required to wear a life jacket while recreating. The law does not apply to children under 13 years of age who are on a sailboat and are constrained by a harness tethered to the sailboat, in an enclosed cabin, or an a vessel engaged in an emergency rescue situation. DBW manages a number of safety programs and provides resources to encourage safe boating on California’s waterways. For more boating and water safety information or laws, please visit BoatCalifornia.com. SACRAMENTO — The Division of Boating and Waterways invites public and private marina owners to apply for a Federal Boating Infrastructure Grant (BIG) now through August 3, 2018. California BIG projects received $1.7 million in the previous grant cycle. BIG is a competitive program open to both publicly and privately owned marinas to renovate or construct docks, restrooms, gangways and dockside utility hook-ups for visiting or transient recreational boaters with vessels 26 feet or greater in length. In 2018, a total of $8 million is available for BIG projects nationally. BIG is funded by the U.S. Fish and Wildlife, Wildlife and Sport Fish Restoration Program. SACRAMENTO - The Division of Boating and Waterways (DBW) announced today the participation of more than 40 California marine law enforcement agencies in the national boating under the influence (BUI) awareness and enforcement campaign dubbed “Operation Dry Water.” From Friday, June 29 to Sunday, July 1, law enforcement agencies across the United States will increase patrols and/or carry out BUI checkpoints to help reduce the number of alcohol- and drug-related accidents and fatalities and foster a stronger, more visible deterrent to their use on the water. *In an Operation Dry Water 2017 Annual Report, NASBLA named California’s San Bernardino County Sheriff’s Office the “Top Agency Award - Small Category” for deploying 10 officers and making 13 boating under the influence arrests during last year’s campaign. Recreating in PG&E canals and flumes is strictly prohibited. Stay alive by staying out of these water conveyances, which are very dangerous due to slippery sides and fastmoving cold water. Stay out of canals and off elevated flumes. Life jacket wear is the number one preventive measure boaters and anyone swimming, rafting or wading in California’s coastal and inland waterways can take to save lives. Unlike the traditional orange “horse collar” of previous generations, today’s life jackets are technologically advanced, making them more convenient, less restrictive – and are now custom designed for specific water activities such as fishing, cruising or tow sports. Check the label for U.S. Coast Guard approval and the manufacturer’s ratings for your size, weight and boating activity. See that the jacket fits snugly and does not ride up over your chin or face. DBW has approved a number of basic boating safety courses. Passing one of these approved courses also makes boaters eligible for the new California Boater Card. The division manages a number of safety programs and provides resources to encourage safe boating on California’s waterways. Many programs and events will kick-off during National Safe Boating Week (May 19-25). Every year, recreational boating advocates from across the United States and Canada use this week before Memorial Day weekend to remind boaters on the importance of life jacket wear and other key safety messages. Below are California’s safety programs for 2018. The division encourages boaters and water enthusiasts to take advantage of these resources. National Safe Boating Week kicks off with “Wear Your Life Jacket to Work” day on Friday, May 18. Californians are encouraged to wear a life jacket to work, take photos and share them on DBW’s social media sites: Facebook, Twitter or Instagram using the hashtags #BoatCA and #SaveTheOnesYouLove. Wearing a life jacket outside of a water activity heightens awareness of different life jacket styles and demonstrates their comfort and versatility. DBW has developed a boating facility locator app version of its web-based boating locator - BoatCA. The free BoatCA app offers an array of boating safety information, float plan emails, clean and green boating practices, as well as information on nearly 1,000 boating locations and facilities. The Pumpout Nav app directs boaters to pumpout 3 stations and teaches boaters how to use pumpouts. Both apps are available on iTunes and Android platforms. For more boating and water safety information or laws, please visit BoatCalifornia.com. SACRAMENTO, Calif. - California State Parks’ Division of Boating and Waterways invites marinas and yacht club operators to attend two free seminars, one in the Bay Area and one in the Delta, to learn about proper communication techniques when responding to an oil spill. These techniques will prepare them in the event of an actual incident. The seminars are set for May 8, 2018 in Vallejo and May 17, 2018 in McClellan. Tools and resources available to increase communication capabilities between boating facilities and the Office of Emergency Services during an oil spill. Key presenters include: California Department of Fish and Wildlife Office of Spill Prevention and Response, California State Parks Division of Boating and Waterways, California Coastal Commission’s Boating Clean and Green Program, and the Governor's Office of Emergency Services. To register, please contact California Coastal Commission’s Boating Clean and Green’s Program Coordinator Vivian Matuk at vmatuk@coastal.ca.gov or (415) 904-6905. Location and directions to the workshop are included with confirmation of the registration. Free parking is available at the workshop sites..
SACRAMENTO, Calif. - The Division of Boating and Waterways (DBW) in conjunction with partners invites the public to learn how to prevent the further spread of aquatic invasive species (AIS) in California’s waterways. Several workshops will be held in Northern California starting in early April to help the public learn about the effects AIS can have on the economy and the environment, how to recognize AIS in their region, and how to take action to prevent it from spreading. Workshops are free, but spaces are limited and pre-registration is required. 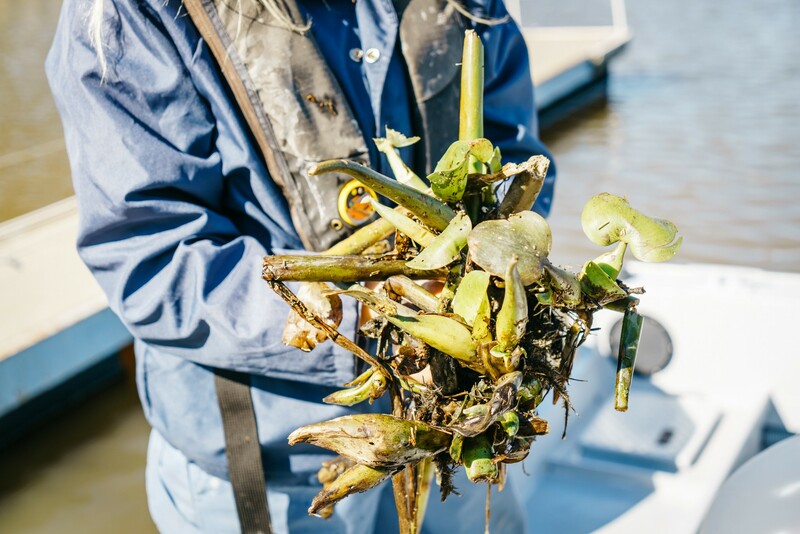 Aquatic invasive species such as quagga and zebra mussels, water hyacinth and Brazilian waterweed pose threats to California’s water delivery systems, hydroelectric facilities, agriculture, boating, fishing and the environment. Recreational activities, including boating and fishing, can spread AIS from infested waters to uninfested waters. In addition to DBW, AIS experts from the California Coastal Commission, the California Department of Fish and Wildlife and U.S. Fish and Wildlife Service will be on hand at these workshops. To register, please contact Boating Clean and Green’s Program Coordinator Vivian Matuk via email at vmatuk@coastal.ca.gov or phone (415) 904-6905. Location and directions to the workshop are included with confirmation of the registration. Free parking is available at the workshop sites. Lunch will not be provided. The AIS workshops are part of the California’s Boating Green and Clean Program. The program is an education and outreach program conducted through the California State Parks Division of Boating and Waterways and the California Coastal Commission. Staff and volunteers promote environmentally-sound boating practices to marine businesses and boaters. For more information, please visit www.BoatingCleanAndGreen.com. 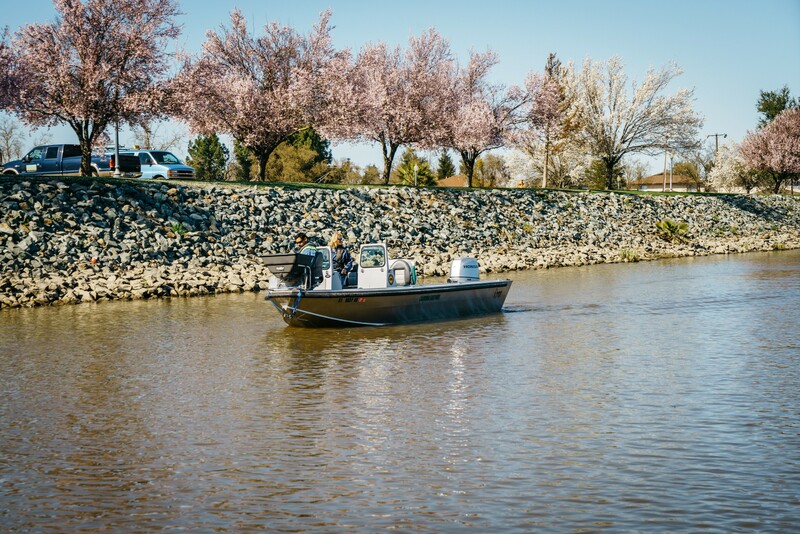 Sacramento, Calif. – The Division of Boating and Waterways (DBW) announced today its plans for this year’s control efforts for aquatic invasive plants in the Sacramento-San Joaquin Delta (Delta). 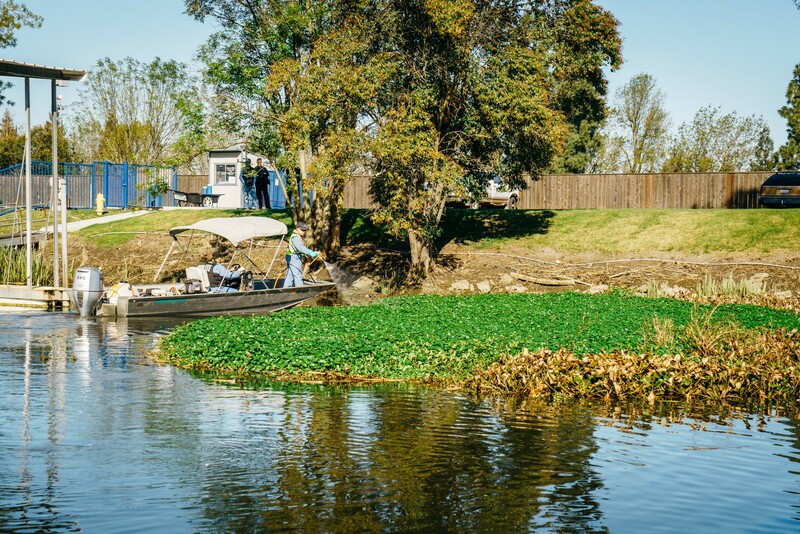 Starting March 5, DBW will be controlling water hyacinth, American spongeplant and Uruguay water primrose along waterways entering the Stockton Deep Water Channel via mechanical harvesting. The use of herbicides will start on Monday, March 12 for the following aquatic invasive plants: water hyacinth, Egeria densa, South American spongeplant, Uruguay water primrose, curly-leaf pondweed, Eurasian watermilfoil, fanwort and coontail. Treatment start dates may change depending on weather conditions and plant growth/movement. These aquatic invasive plants have no known natural controls in the west coast’s largest estuary, the Delta. They negatively affect the Delta’s ecosystem as they displace native plants. Continued warm temperatures help the plants proliferate at high rates. Plants are also known to form dense mats of vegetation creating safety hazards for boaters, obstructing navigation channels, marinas and irrigation systems. Due to their ability to rapidly spread to new areas, it is likely that the plants will never be eradicated from Delta waters. Therefore, DBW operates “control” programs as opposed to “eradication” programs. The division works with local, state, and federal entities to better understand the plants and implement new integrated strategic methods and increase efficacy. All herbicides are registered for aquatic use with the U.S. Environmental Protection Agency and California Department of Pesticide Regulation. Treated areas will be monitored to ensure herbicide levels do not exceed allowable limits and that herbicide treatments have no expected adverse impacts on the environment, agriculture or public health in or near the planned treatment areas. The public may view the public notices and sign up to receive weekly updates on this year’s treatment season on DBW's website. Water Hyacinth, South American spongeplant and Uruguay water primrose. Type of Herbicides: Glyphosate, 2,4-D or Imazamox. Potential Treatment Areas: Initially in and/or around, but not limited to the following areas: San Joaquin River, Empire Tract Slough, Middle River, Fourteen Mile Slough, and Latham Slough. See map for treatment areas. Mechanical Harvesting Sites:Select areas of the Delta with high infestations or coverage of South American spongeplant, Uruguay water primrose and/or water hyacinth. See map for potential mechanical harvesting control areas. Egeria densa, curly-leaf pondweed, Eurasian watermilfoil, fanwort and coontail. Treatment Period: Starting March 12, 2018 through October 31, 2018, treatment period based upon DBW field survey data, water temperatures and fishery surveys. o Near Old River: Cruiser Heaven, Diablo Ski Club, Discovery Bay, Franks Tract, Piper Slough, Sandmound Slough and Taylor Slough. o Sacramento Area: Barker Slough, French Island, Lindsey Slough and The Meadows. o Stockton Area: Atherton Cove, Bishop Cut, Buckley Cove, Disappointment Slough, Duraflame, Fourteenmile Slough, Honker Cut, Mosher Slough, Pixley Slough, White Slough and Windmill Cove. This type of control method is not used for submersed aquatic vegetation. These plants spread by fragmentation. Cutting the plants back exacerbates the problem, as shreds of the plants float away and re-propagate. Last year, DBW treated 3,023 acres (210 sites) of floating aquatic vegetation and 2,967 acres (46 sites) of submersed aquatic vegetation. Mechanical harvesting efforts totaled 8.08 acres. The division anticipates 2018 to have drier conditions compared to 2017 and treatment of aquatic invasive plants up to 10,400 acres. A combination of herbicide, biological and mechanical control methods will be used to help control invasive plants at high priority sites in the Delta. Funding for DBW’s aquatic invasive plant control programs comes from the Harbors and Watercraft Revolving Fund, which receives revenues from boaters’ registration fees and gasoline taxes. In 1982, California state legislation designated DBW as the lead state agency to cooperate with other state, local and federal agencies in controlling water hyacinth in the Delta, its tributaries, and the Suisun Marsh. The Egeria Densa Control Programwas authorized by law in 1997 and treatment began in 2001. In 2012, Spongeplant was authorized for control upon completion of the biological assessment. 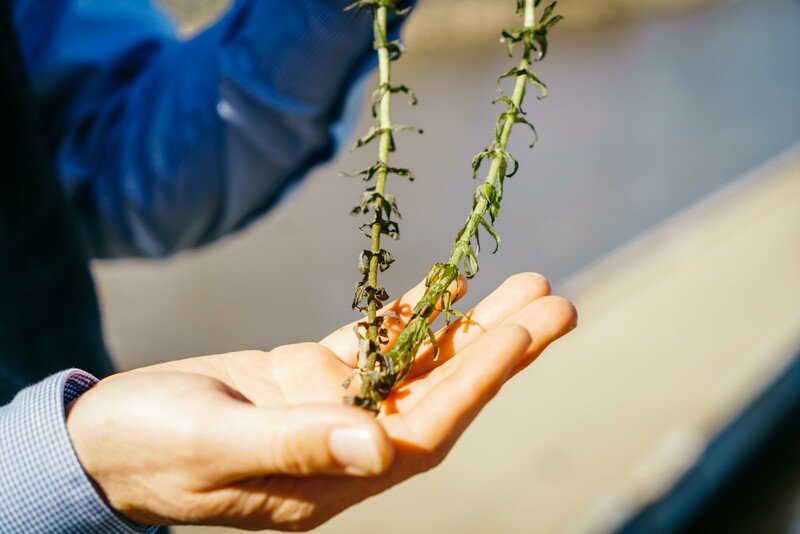 In 2013, DBW was able to expand its jurisdiction to include other invasive aquatic plants, and since then other aquatic invasive plants such as Uruguay water primrose, Eurasian watermilfoil, Carolina fanwort and coontail have been added to the AIPCP program. To report sightings, subscribe for program updates or for more information regarding the control program, connect with us online at www.dbw.parks.ca.gov/AIS, via email at AIS@parks.ca.gov or by phone (888) 326-2822. Provides safe and convenient public access to California’s waterways and leadership in promoting safe, enjoyable and environmentally sound recreational boating. Learn more at dbw.parks.ca.gov. SACRAMENTO – The Division of Boating and Waterways (DBW) invites the public to become volunteers in California’s Dockwalker Program. Dockwalkers help raise awareness about important boating practices related to oil, fuel, sewage, trash, and marine debris through the distribution of educational material (boater kits) at marinas, boat launch ramps and boating events. The free trainings are set to begin later this month, February 24. Pre-registration is required. Participation in the program, including the training sessions qualify as community service. California has about 2.6 million recreational boats and more than 4 million recreational boaters. It is important for recreational boaters to not only boat safely, but to also implement sound boating practices. Safety and protecting the environment go hand in hand. Since 2000, more than a thousand volunteers have become Dockwalkers and approximately 100 to 150 people are active every boating season. Marinas and yacht clubs are encouraged to participate in the Dockwalker Program. Participating facilities receive educational materials and tools to operate a clean boating facility and minimize water quality impacts. This program provides marinas with points towards the Clean Marina Designation and participation in the Dockwalker Program counts towards the nomination of the Club of the Year under the community service category. In addition, yacht clubs and marinas are essential in spreading awareness directly to boaters. Partnerships with the Bay Foundation (DBW Clean Vessel Act Program), the U.S. Coast Guard Auxiliary, the U.S. Power Squadrons, Save Our Shores, Lake Berryessa Partnership and many more organizations are integral to this program’s success. The Dockwalker Program is led by the California Coastal Commission and the Division of Boating and Waterways’ Boating Clean and Green Program. For more information on the program including testimonials, please visit www.BoatingCleanandGreen.com. SACRAMENTO - The Division of Boating and Waterways (DBW) is now accepting grant applications for the disposal of abandoned and unwanted vessels and law enforcement safety equipment. A total of $4.25M in funding from the Abandoned Watercraft Abatement Fund (AWAF) and Boating Safety/Enforcement Equipment (BSEE) grant programs is available to local public agencies statewide. Applications will be accepted from February 1, 2018 through April 30, 2018. DBW brings together a body of knowledge as the state’s expert in recreational boating-related matters, including public access, safety and education, marine law enforcement, and consumer and environmental protection. AWAF and BSEE are two programs that help improve safety on California’s waterways and alleviate the issue of abandoned vessels. Numerous abandoned and derelict vessels are a pervasive environmental and public safety problem in coastal and inland waterways. They are not only an eyesore destroying the beauty of the waterways, but also pose an environmental hazard. Last fiscal year, DBW provided $2.75M in AWAF funding and $1.5M in BSEE funding to local public agencies to help alleviate the problem. For those interested in applying for these grants, DBW is hosting workshops for each program to guide new applicants and returning grantees. The division will help applicants through all the steps in the application submission process. It is recommended that a representative from an interested agency attend a four-hour workshop. Workshops will be held in Sacramento on February 15 and 16. Pre-registration is required via email to Joanna.Andrade@parks.ca.gov by Monday, February 12. Please include the program name (AWAF or BSEE), name of attendee(s), agency name and phone number in the email. For information on other grant and loan programs, please visit DBW’s website at www.DBW.parks.ca.gov/grantsandloans.